I've grown up in Colorado and have been fairly fortunate to spend many weekends and family camping trips exploring the various mountainous wild areas in the state. But, just like many families, we tend to have the familiar areas of forest or lakes that we like to visit and tend to return to the same or nearby areas year after year. I have been looking for new areas to explore and yes, they are new to me, certainly not undiscovered. Recently I was looking through some photos online and saw an amazing cliff face with stars above it. I dug into the location a little more and discovered that the towering cliff face was Steamboat Rock in Dinosaur National Monument. 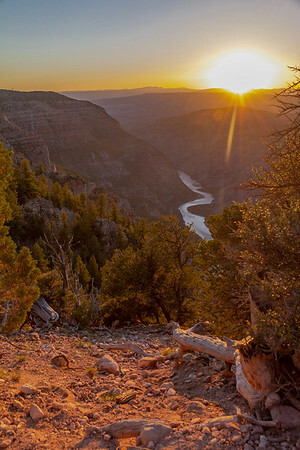 I had certainly heard of Dinosaur National Monument, but realized I had never actually visited the park and I really didn't even know much about it. Sunrise above Steamboat Rock in Dinosaur National Monument. I started using Google to research the park more and planning out how to get to Steamboat Rock to get some sunrise and sunset photos. I was even hoping to get some cool star photos, but unfortunately the moon was almost full during the weekend I had available and it would be up pretty much the entire night, rising just before sunset and setting just before sunrise. Through the research I was impressed at just how large and remote the monument is. Most of the area is only accessed from a select few roads that go into the interior of the park. And of those roads that do go closer to the Green and Yampa rivers, some are dirt roads where 4x4 or high clearance vehicles are recommended. In order to get close to Steamboat Rock, you have to enter the canyon area of Dinosaur National Monument from the edge of the small town of Dinosaur, Colorado. From there, it was about a 30 minute drive on paved roads, then another hour of high clearance dirt road to drop down to the river. The road travels through two very steep canyons and when it gets wet they say that the road is the consistency of peanut butter and impassable. The roads were dry when we went through, but I could definitely see how it would be difficult when wet. As the road gets closer to Steamboat Rock and the confluence of the Green River and Yampa River, it travels through a narrow canyon and drops into Echo Park. This area is a large basin surrounded by cliffs. There is a small first-come first-serve campground that was only about half full on the weekend we visited. There is a place to launch or retrieve rafts if you have a permit and a ranger house. There are also trails that go along the river in either direction from the road. Those trails skirt the edge of the rivers and are not well marked. My son and I tried some fly fishing along the Yampa river, but despite seeing a handful of fish surface for bugs, I couldn't entice any to take a fly. Since we were there in June, the water was flowing fast and cold thanks to the typical melting of the snowpack. Although my son briefly waded in a sheltered, slower section of the river, it was a little too cold for him to spend much time in the water. We spent two nights at the Echo Park campground at the base of the impressive cliffs. There were a few other campers, but the adjacent sites remained empty. The second night we went up to Harper's Corner and hiked out to get an impressive view from above Steamboat Rock. As the sun set behind us, the impressive rock formation was lit with a range of orange, red, purple and blue as the last light faded into darkness. As the name implies, Dinosaur National Monument is known for Dinosaur fossils that were discovered on the west side of the park. Those fossils were located in the area of an ancient river that resulted in thousands of bones being deposited in a very concentrated area. The fossils that have been recovered from that site have been sent to museums all over the world, including the Smithsonian. Earl Douglass discovered the fossils in 1909 and led the efforts to excavate and preserve the fossils. He ultimately had the vision of leaving a section of the fossil bed intact in a way that visitors could come and actually view the fossils still in place in the rock and soil that they were discovered in. Today visitors can come and see hundreds of bones still in the rock, even touching some of the larger fossils that can handle it. While we only had a short weekend to explore this remote national monument, I have already decided this is a place I will have to return to. It also goes to show some of the amazing parts of Colorado that can be missed if you stick to only exploring the parts that you are familiar with. On the east side of Glacier National Park St Mary’s Lake dominates the initial drive along Going To the Sun Road. The lake comes into view shortly after entering the east entrance of the park. You can drive along the lake, or stop at the St Mary's Visitor Center and take a shuttle. 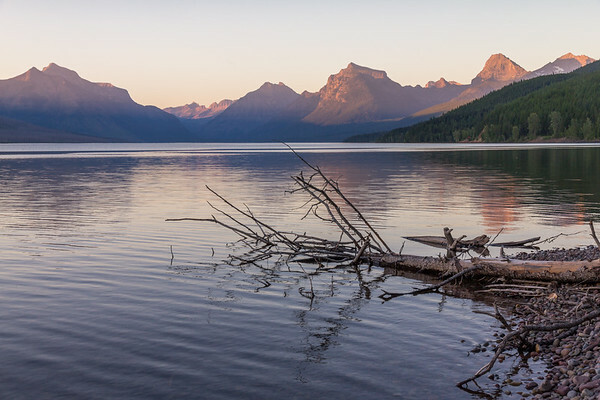 At just over seven miles long, this is the second largest lake in Glacier National Park, after Lake McDonald. 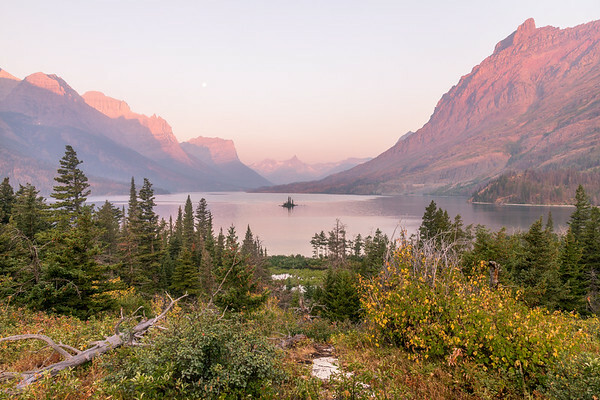 St. Mary's Lake lies about 1500 feet higher in elevation than Lake McDonald on the west side. As a result, the glacier fed waters tend to be colder. We visited Glacier National Park in two parts. We spent the first few days on the west side of the park, drove up to Banff National Park for several days, then returned along the east side of Glacier National Park. The truck we used to pull our camper was a little too big to drive all the way up Going to the Sun Road, so we ended up taking the shuttle up to the top, once from each side of the park. As we drove along St. Mary's Lake, the bus driver would talk about each of the stops and what trails or viewpoints were available. There was one parking area that we passed that was not a regular stop, but the driver mentioned that from that viewpoint you could see up the St. Mary Valley and he believed it was the most photographed view in the park. The next morning my family wanted to sleep in and I decided to get up early and take some photos. I ended up stopping to check out the view that the bus driver had mentioned. Before sunrise, there were only two other photographers in the parking lot, which had been completely full the previous day as the bus drove by. There were fires burning to the west of the park and the resulting haze made it difficult to see the furthest peaks at the end of the lake. I do think that the haze added some additional orange and red colors to the sunrise that morning. There wasn't a cloud in the sky and very little wind. I stayed and took photographs until the sun rose higher in the sky and more people started to show up. I drove back towards camp, stopping to take a few more pictures along the way. As I made it back to the camper my wife and kids were waking up and I was just in time for breakfast. Although I really enjoyed our trip I was already making mental notes to return when there wasn't so much smoke and a little earlier in the summer when there would be more snow on the mountains. At ten miles long and a mile wide, Lake McDonald is the largest lake in Glacier National Park. The lake is an impressive 472 feet at it's deepest point. This was one of the first points that we stopped at on our trip to Glacier. For such a large, glacier fed lake, it was actually a fairly comfortable temperature for wading through the smooth small rocks along the shore. As I set up to take some photos of the sun setting on Lake McDonald, my kids waded around in the water. As you can see in the picture below, there was a lot of haze in the area due to numerous wildfires burning in Idaho and Montana during the summer of 2017. 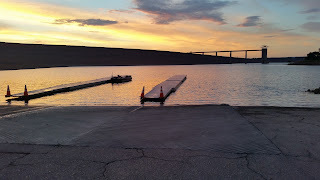 We had also planned the trip near the end of July hoping to a avoid snow and potential bad weather while towing a camper from Colorado to Canada and back. In hind sight, I think we should have gone a little earlier, probably around mid to late June. I think we would have been able to see more snow on the mountains a little earlier in the summer. 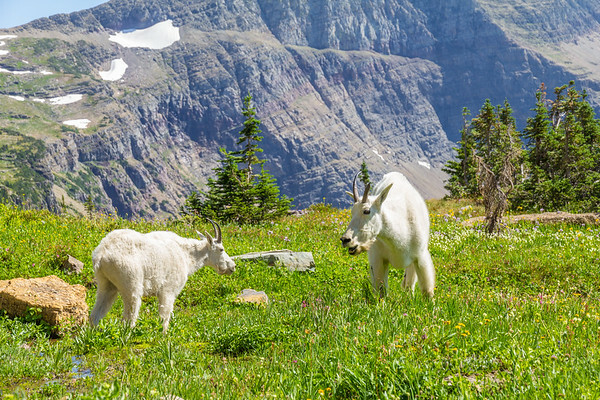 Check out the last post on Mountain Goats near Hidden Lake. Although there are fish in the lake, there are not a lot of nutrients in the water, so Lake McDonald is not a major destination for fishing. We did see a couple people trying their luck with spinning gear, but I didn't see anyone get any bites. On the west side of the lake, near where the above picture was taken, there is a national park service campground. About 5 miles to the east is the historic Lake McDonald Lodge, which was built in 1913-1914. Even if you aren't planning on staying at the lodge, it is worth walking through and checking out the gift shop to see the hunting lodge inspired architecture. Located in Montana at the border with Canada, Glacier National Park is a 1,583 square mile wilderness area with jagged peaks and icy, glacier fed rivers. Established in 1910, Glacier National Park is home to breath taking mountain peaks, amazing wildlife and abundant wildflowers. During the summer of 2017 my family planned a multi-week camping trip that would take us through Glacier National Park and on to Banff National Park in Canada. Often referred to as the Crown of the Continent, this ecosystem encompasses the the Continental Divide from Montana into the southern Canadian Rockies of Alberta and British Columbia. Although we have visited Yellowstone National Park several times, we never drove further north to visit Glacier or Banff. We initially planned to travel to Yellowstone during 2017, but quickly had the thought that we should extend our plans further north and explore some of the most amazing National Parks that we hadn't yet stepped foot in. We set aside time, bid for vacations from work and set dates at the end of July to beginning of August. With camper in tow, we traveled nearly 3,000 miles through some of the most amazing scenery in the world. I have grown up in Colorado and love the mountains and high altitude playground that we have in our backyard. The amazing thing to me is how visiting the Rocky Mountains in another part of the country can look so similar, yet so different. Mount Rainier National Park was another place that I remarked how the forest surrounding a 14er could be so much different than the 14ers I have climbed in Colorado. Mountain Goat Nanny, Glacier National Park, Montana. In some ways, Glacier National Park seemed similar to parts of Colorado. Here on the edge of Canada, however, the peaks seemed more jagged and imposing. They edges of the mountains were steep and cut off, evidence of glacier activity carving out the valleys that we were now driving through. Something that I found slightly amusing was the fact that many of the peaks, despite their impressive appearance, were relatively low in altitude in comparison to many of the mountains of Colorado. We rode one of the park service shuttles up to Logan Pass, which sits at a somewhat low elevation of 6,647 feet above sea level. 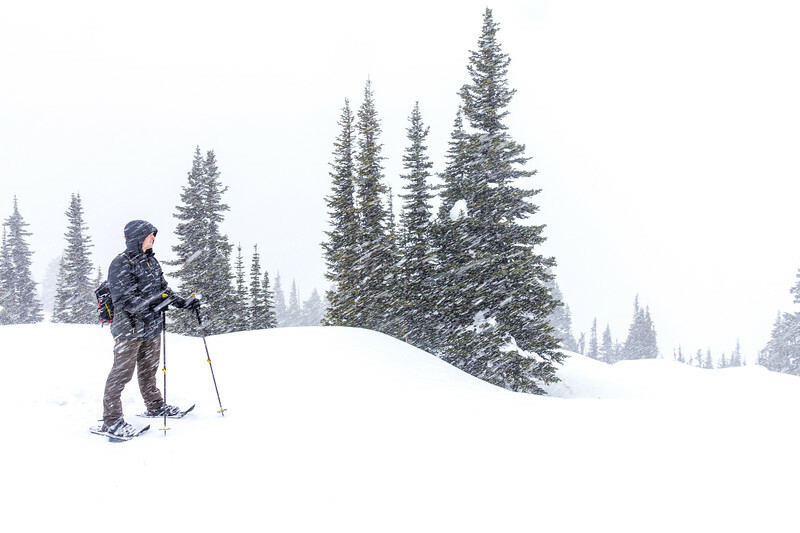 While that elevation barely encompasses the foothills around Denver, walking out from the visitor center at Logan's Pass, you are most certainly in an alpine environment. In fact, the highest peak in Glacier National Park is Mount Cleveland at 10,479 feet. That is about the elevation I would expect to start seeing the alpine environment back here in Colorado, but further north at the edge of Montana and Canada you see glaciers and barren slopes. One of my favorite animals to see at higher elevations are Mountain Goats. Though not very big, these majestic white mammals are best suited to cold, harsh climates. It is very rare to see them at lower elevations, so most people only ever see wild Mountain Goats when visiting remote and high altitude parks like Glacier, Banff and Rocky Mountain National Park. Around Logan's Pass and while hiking to Hidden Lake, we were rewarded with dozens of mountain goat sightings, including several goat kids with their mother, or nanny. 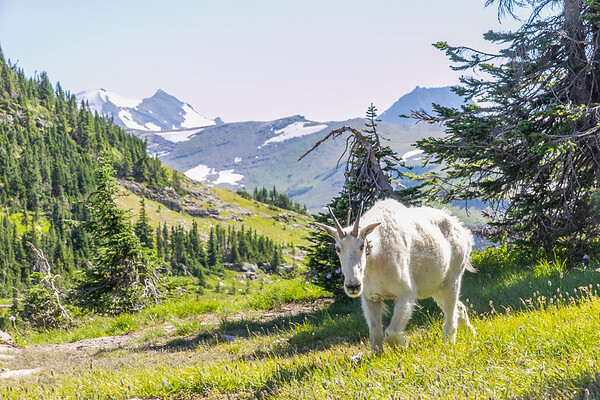 Several of these goats were accustomed to the thousands of tourists that regularly travel the trails along Going to the Sun Road. We had several, like the one pictured above, that seemed to be perfectly comfortable walking within a few yards of the trails and the people on those trails. I was able to get the photo above and the one below with a simple Canon 15-85mm IS lens. Using a wider angle lens and walking so close by these amazing animals gave me the opportunity to get some awesome photos with dramatic views in the background. If you decide to head up to Logan's Pass, I would definitely recommend either going very early, or taking the park service shuttles to get up there. Because we were traveling with a camper and had driven to the park with a full size pick-up, we were too long to drive up to the visitor center our selves. Although I would have liked getting to the top earlier for better light, it was nice riding on the shuttle and being able to actually look at the view as we drove up. Once at the top we noticed that even by 8 or 9 in the morning there were lines of cars trying to get into the parking lot and find a parking spot. It was certainly nice not having to worry about that, but I have a feeling that if you were arriving at the top in time to photograph the sunrise, you would probably not have any issues finding a spot. There were also throngs of people milling around and through the visitor center. Each time a shuttle or tour car would come by, even more people would pile out. We decided to walk to Hidden Lake, which is about a 5.4 mile round trip from the visitor center. Most of the hike is fairly easy, but the last part of the trail drops steeply to the lake, which of course, means an initial steep climb back up to the top of the ridge on the way back. The trail starts out with a number of boardwalks and wide paths designed to keep visitors off of the fragile alpine ecosystem. We were luck enough to spot a Grizzly Bear on the edge of treeline a few hundred yards from the trail. As we continued along the trail, those large groups of tourists started to get thinner. Few people were able, willing or interested in actually traveling the length of the trail to Hidden Lake. I would estimate that somewhere around 1/4 to 1/2 of the people on the beginning of the trail made it to the overlook over Hidden Lake. Maybe 1/10th or less of the people actually continued on pass the overlook to actually hike down to the lake. When we made it down to the lake it was clear, with a turquoise hue and very cold. We say on the edge of the bank with our feet in the water for awhile, enjoying the beautiful landscape surrounding us. A few, more adventurous hikers were jumping into the lake, but few swam far in the frigid water. We had a Billy (male mountain goat), materialize out of the trees behind us and lay down under a tree a mere 30 yards away. After awhile we decided we should probably head back. We were getting close to the time that the park shuttles stopped operating for the day and we certainly didn't want to get left at Logan's Pass with no way to get back down. The start of the climb up from Hidden Lake was hot and steep. We powered through it and were able to enjoy the much easier stroll from the overlook back to the parking lot. The hike to Hidden lake is a popular hike, but we still enjoyed getting out away from some of the bigger crowds and seeing a part of the park that was just out of reach from the roads and parking lots. 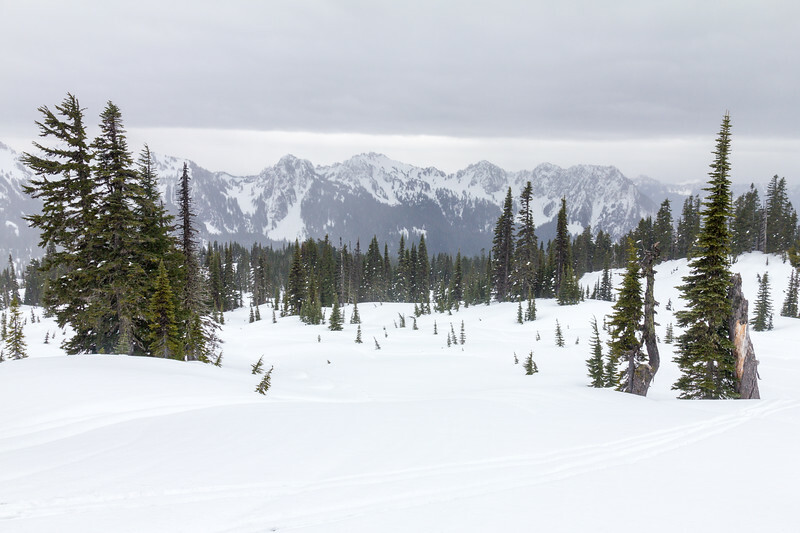 In the last post, I talked about snowshoeing above Paradise in Mount Rainier National Park. As we drove out of the park for the night there was snow falling at the higher altitudes above Longmire and rain pouring at the lower altitudes. We planned on returning the next day and hoped to go to Paradise again, but we weren't sure what to expect as we entered the park. At the entrance station we were warned that the gate between Longmire and Paradise was closed and wouldn't open for the duration of the day. We were disappointed that we wouldn't be able to make it to Christine Falls to capture an iconic picture from below the road, but we knew that there was still a lot of opportunity to hike around the lower elevations. As we proceeded past the entrance station, we noticed that the snow level had dropped significantly since our drive out. At the lower elevations, where it had been raining the previous night, there was now a fresh layer of snow. We started to see snow covered roads and forest only a third of the way to Longmire. We passed a National Park Service ranger with his emergency lights on next to a small sedan that had spun off the road and into a four foot deep ditch. I was happy that we had a four wheel drive vehicle to use, but found at cautious speeds the roads did not seem that slick. When we got to Longmire, there were more cars than the previous night. We noticed that people were hiking the Rampart Ridge Trail to the north. We decided that we wanted to walk part of the Wonderland Trail that followed the Nisqually River. 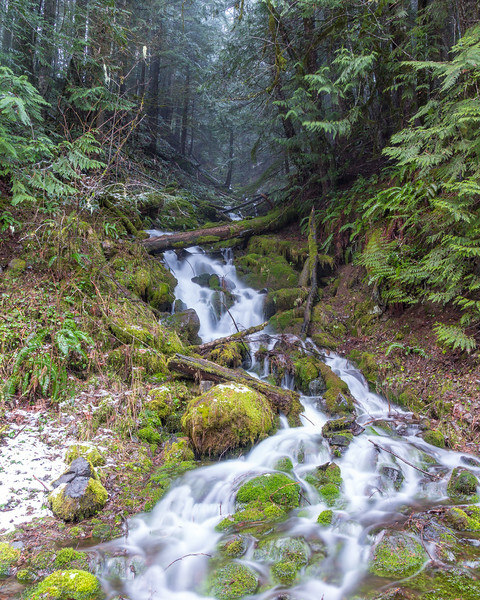 The Wonderland Trail is 93 miles and circumnavigates Mount Rainier. As we started northeast on the trail there was about an inch of fresh snow, free of any other footprints. We were the first two people to walk the trail since the snow had fallen. It made us feel as though we were completely alone and isolated in the park. Although we had our snowshoes with us, the shallow snow was easy walking in just our boots. We walked along the gently rolling path as it meandered among the trees with heavy layers of moss. Wonderland Trail in January, Mount Rainier. As we made it about a mile up the trail we noticed bits of blue sky peeking out above us. We talked about continuing. There wasn't a lot of opportunity to see Mount Rainier from the trail and we decided to turn around and head back to the car. We were hoping to find a spot with better visibility, but would be disappointed later when the clouds rolled back in before we could get anywhere with a view. We tried to stop at a couple different would-be scenic points along the road, hoping for a clearing between the clouds. 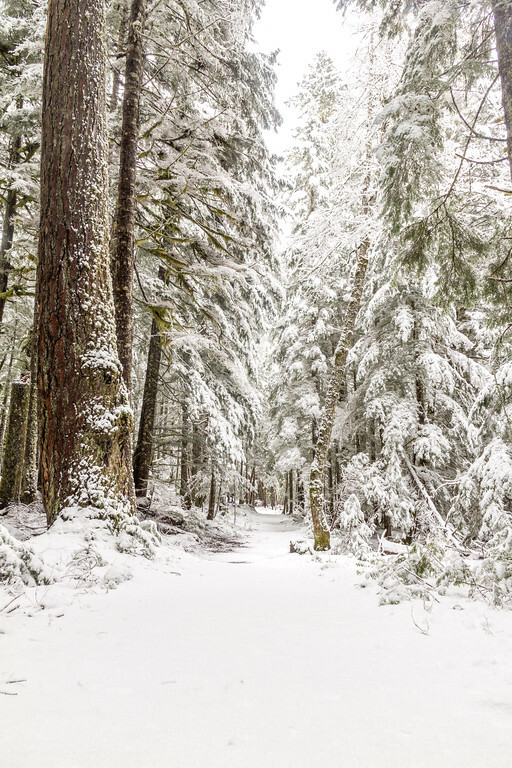 We tried Kautz Creek, but found that the snow covered boardwalks were slicker than polished ice. As we would slide and catch each other from falling we contemplated turning around, but pushed on to the viewpoint along the river. After walking a mere 30 yards or so of boardwalk, that felt more treacherous than snowshoeing in white out conditions the previous day, we arrived at the creek. Ironically the viewpoint was just off the road and the boardwalk had just run parallel to the road. I took a couple pictures, but was disappointed by the lack of view due to the clouds. We decided to climb a small fence and walk back along the road instead of navigating the boardwalk again. Driving back to the west we stopped at the Westside Road, which was closed for the season. We decided to walk up that way to see if there were any better views. We walked about a mile and a half up the road. We never broke out of the giant trees and weren't able to find a viewpoint. However, there were a number of small waterfalls that fell along the side of the road. We stopped to photograph a couple of them. The low clouds and mixed snow/rain along the hike made the trees in the background fade away. We passed some fresh Blacktail Deer tracks along the road, but weren't able to see the deer. As it was getting dark we decided to turn around and head back towards the car. We finished the last half mile by headlamp. The thick forest and tall trees around us blocked out any light that the twilight might have provided. As we drove out of the park, we stopped at Whittaker Mountaineering again to drop off the snowshoes and tire chains. They had already closed for the night, so we dropped the equipment off in the after hours drop box. This turned out to just be a door on the side of the building. As we dropped the snowshoes through the door we could hear them clatter to the ground on the other side. With the gear dropped off, we headed back to the AirBNB. At 14,410 feet tall, Mount Rainier towers over the landscape of Washington State. Mount Rainier is the highest mountain in the Cascade Range and the 5th highest mountain in the lower 48 states. The apparent height of Mount Rainier is dramatic, as the base of the mountain lies at a much lower elevation than the 14ers in Colorado. This results in a mountain that towers over it's surroundings in a way that makes it seem massive. Mount Rainier National Park is a popular destination for climbers, mountaineers and hikers using the mountain to prepare for bigger ascents in Alaska, the Alps or the Himalayas. Growing up in Colorado hiking, climbing and backpacking, I have imagined donning an ice axe and crampons to ascend to the top of Mount Rainier. I used to read through the definitive resource on the topic, "Mountaineering: The Freedom of the Hills." I would practice what I could, I have greatly benefited from the chapters on hiking and backpacking in general. When I was in high school I rock climbed both indoor and at the local crags. I have even spent a few winters playing around with crampons, glissading and even sleeping in a snow cave on Mount Quandaray. But, I never quite got around to traveling to Washington and making an attempt to summit Mount Rainier. This January, my wife and I decided to take a trip to Seattle. I have never been and she had not been there since she was a child. In addition to the typical tourist sites, and the Seattle Boat Show, I decided that I wanted to go to Mount Rainier National Park while we were there. Now obviously January is not the peak tourist season to visit the park. In fact, we had to do some research about just what would be open and accessible for a winter visit. As it turns out, only a small portion of the park is actually open during the winter. The Longmire area tends to stay open all winter and the road from Longmire to Paradise is maintained, but depending on the weather may or may not open on any given day. In addition to the frequent road closures to Paradise, snow chains are required for any vehicle traveling in the park during winter. After leaving Seattle, we drove about an hour and a half to get to our little bed and breakfast that we booked through AirBNB. We had heard of a store called Whittaker Mountaineering nearby that would rent out chains and other equipment. We stopped by that afternoon to confirm that they would have what we needed and make sure we knew when they opened. The next morning we went back to rent the required chains, as well as some snowshoes. We decided that even though we were not going to get to summit the mountain, we wanted to at least enjoy the park through snowshoes. Now, I'm not an expert at snowshoeing and my wife had never done it before, so I was a little worried about how much "fun" it was actually going to be. Nevertheless, we rented what we needed and the nice young lady at the store told us that we may even get lucky and be able to see the mountain that day. We purchased an annual, all-parks pass to take advantage of Rocky Mountain National Park back at home in Colorado. At the entrance gate we found out that the road was open all the way to Paradise. We decided to head straight to the top, since we were expecting snow over the next couple days. As we drove the winding road up to Paradise, I was pleasantly surprised that the road was completely dry to the top. As we parked in the parking lot, we could see kids sledding on a hills side roped off just for that purpose. There were several other couples getting ready to snowshoe and a pair just getting back. As we put on a couple extra layers and got ready to go, we noticed snowflakes in the air. We headed up the mountain, noticing numerous trails from snowshoes and cross-country skis criss-crossing the mountainside. We generally headed up towards Panorama Point, but with no intention of making all the way there and back. As we picked different paths to work our way up the mountain the clouds got lower and the snowfall increased. We kept working our way higher hoping to get a better view of the valley around the Nisqually River, but the closer we got to a good viewpoint, the less we could see. Ultimately, we only walked about a mile, before getting to a ridge line that I believe would have offered an amazing view, if only the snow wasn't quickly falling. After a couple photos, after all, I needed at least one to prove I was snowshoeing in a winter snowstorm on the slopes of Mount Rainer, we headed back to the car. By the time we got back, most of the families sledding had left, only one remained. There was about two inches of fresh snow on the parking lot and our car. Of course, being a rental car, it wasn't equipped with a brush for the snow. After cleaning off the snow by hand we worked out way back down the road to Longmire. The park service plows the roads, but elects to protect the environment by not using sand, salt or chemicals on the roads. Fortunately for us, the temperature during the day had been high enough that the snow was wet, but the road was not icy. We had an easy, uneventful trip back down to Longmire. We noticed a waterfall along the road as we came down, but due to the fading light we decided we would have to attempt to photograph it the next day. We stopped to check out the Longmire Museum before leaving the park for the night. Some of the animals on display were original to the museum first opening up. Colorado has seen a lot of rain and moisture so far in 2015. This spring brought more showers than we typically see. The normal drier weather that we see as summer comes around never really came. The cooler temperatures and rain continued well into the month of July. Many of Colorado's reservoirs and lakes have received enough water this year to bring levels up to full capacity or even higher. 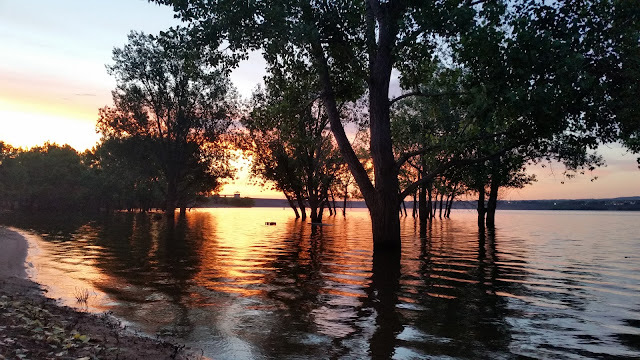 The morning of July 5, 2015, I took a drive through Chatfield State Park to take a look at the flooding. The US Army Corps of Engineers constructed the Chatfield dam beginning in 1967 to curb flooding issues downstream. The lake was later leased to the Colorado State Parks to allow recreational use of the water and surrounding area. As you drive by the park on C-470, it's easy to notice that the dam holding the water back is much taller and more massive than is necessary for the typical water volume held in the reservoir. The dams at Chatfield, Cherry Creek State Park and Bear Creek were designed to prevent flooding throughout the Denver area in the event of 100 year floods, the exact kind of rain fall and precipitation we received in 2013. 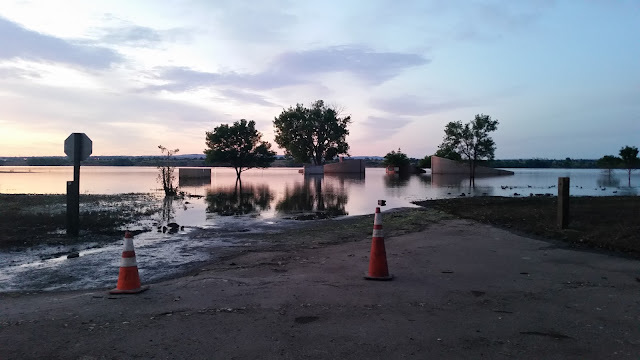 As I drove through the park on July 5, I wasn't witnessing a 100 year flood, but Chatfield was still around 10-12 feet higher than normal. I could tell by the high water mark that I had missed the highest water levels. 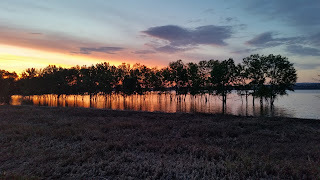 I took a few photos as the sun was coming up to show the extent of the flooding along the west side of the park. Chatfield State Park north boat ramp during high water. The water line at the north boat ramp was nearly to the top of the launcheable area. In fact, the slope at this part of the ramp barely seemed steep enough to launch a small boat. It seemed unlikely that a larger boat could be launched without backing the tow vehicle well into the water. I spoke to the gentleman that launched his boat (as seen at the end of the ramp). He commented that he wouldn't want to try to launch a larger boat at the current water levels. I could see that the high water mark in this area was into the turn around area above the ramp, which resulted in the ramps being closed the weekend before. While I was there the south ramps were still closed. The lack of room at the north ramps and closed south ramps led to long delays for the 4th of July crowd trying to boat at the reservior. These next two photos show part of the shoreline along one of the picnic areas on the west side of the park. Normally the waterline is on the other side of the treeline and there are picnic tables and fire grills in the trees. In the photo below you can see the top of a fire grill if you look closely in the ridge edge of the open, orange colored section of water. In the photo to the right, the entire foreground area was within the previous highwater mark as evidence by the matted, pushed over grasses. For the fishermen, I'm sure the bass in the lake are appreciating the new cover areas available with the submerged shorline and trees. I noticed some bird watchers out taking advantage of the hundreds of birds that seem to have flocked to the area to take advantage of the extra water. Chatfield State Park flooded west shoreline. Note the top of a fire grill in the water towards the center of the photo. Chatfield State Park swim beach flooded and under water. The entire swim beach is now underwater, to include the bathrooms that are nearby. While the entire building is not completely underwater, it's safe to say that enough water is around the buildings to cause serious concerns for the restrooms. For now the waters are receeding and the park is working to return to normal operations.